We docked in Melk early one morning and I went up on deck. It was raining and ordinarily I would have been disappointed, I hate rain, but it had been so hot that, frankly, I just stood there and let it run down my face. Heaven! When we’d boarded in Nuremberg we ran into a couple who were at the conclusion of their cruise, just waiting to get off: “If you see nothing else, you must see Melk Abbey!” they said. 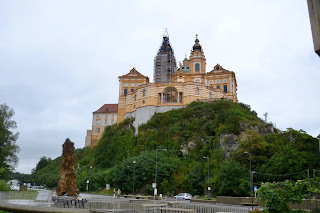 So, after breakfast, we took our receivers and an umbrella and we boarded the bus, heading up to the palatial abbey that dominates the Melk skyline. This has been a Benedictine Monastery for almost a thousand years and although its library had been celebrated for a long time, it had been a Spartan residence for many centuries. Yet, Abbot Berthold Dietmayr in the early 1700’s launched a rebuilding project that created a Baroque palace, complete with a cathedral-like church. Don’t think ‘cold stone edifice;’ this complex is closer to Versailles. Unfortunately, photography is not allowed – so I had to buy the Guide Book. After its renovation the Abbey was used as a Royal Palace with whole sections reserved for Empress Maria Theresa, the only female Hapsburg Ruler, and her husband Francis I, Holy Roman Emperor. 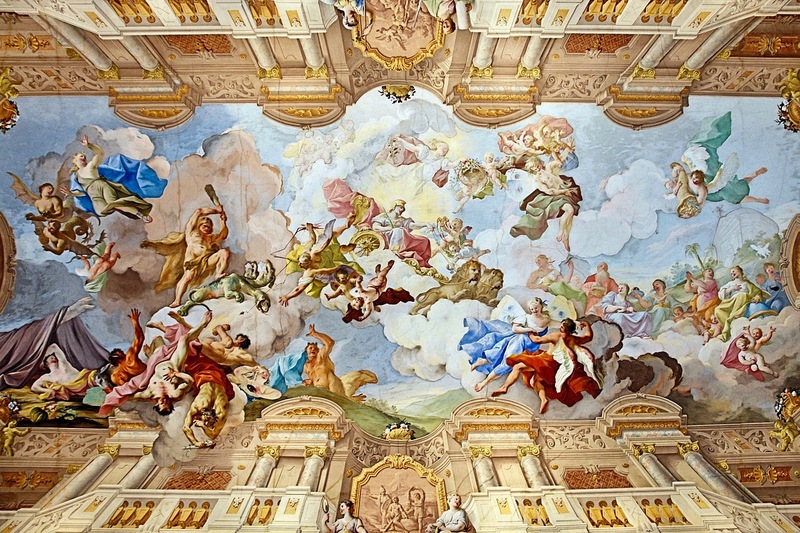 There’s a grand marble hall, like a ballroom, and the ceiling depicts scenes from antiquity, with likenesses of the Hapsburgs serving as the heroes. Much of the Abbey is given over to a museum with crown jewels and vestments of the Catholic Church on display. 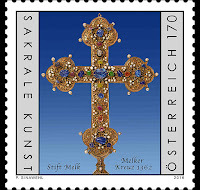 Treasured among these is the Melk Cross, allegedly a sliver of the True Cross (the actual cross of Jesus). The sliver was bestowed upon the Abbey in 1040 and subsequently installed in this exquisite cross in 1362; good luck catching a glimpse of the sliver though, it’s screwed into a compartment in the back. But, the cross has its own story, having been stolen in the 12th Century and reappearing in Vienna. 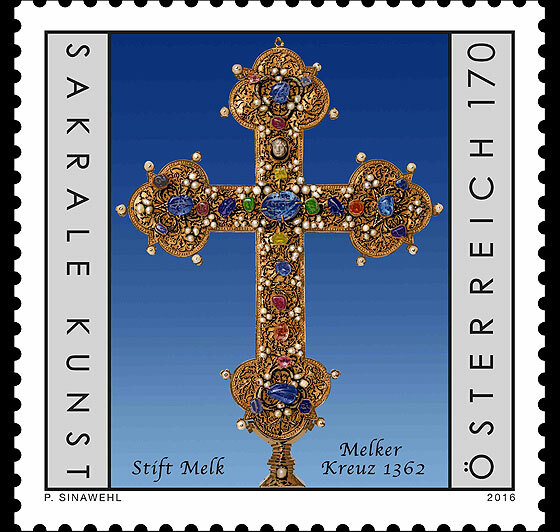 Legend says that God commanded its return to Melk; the cross disappeared from Vienna and was taken by boat back up the Danube to Melk; it was considered a miracle. Melk has its own saint, Saint Coloman, an unfortunate Irish Prince. In legend, he was on a pilgrimage to Jerusalem and lodged near Melk for the night. No one could understand a word he said so they arrested him. Within weeks he was hanged from a tree and his body left on display. Intolerance for those different from us goes back a long way… But, his flesh didn’t corrupt; even after 18 months it was as if he’d only just died. He was declared a saint and his his remains interred in a white sarcophagus high in an altar of the abbey church. The Roman catacombs were discovered in 1578, revealing a cache of more than 500,000 skeletons. It was the time of the Counter Reformation; a resurging of Catholicism in reaction to Lutheran austerity, and the Catholic Church seized these skeletons declaring them martyrs. They were named, and then ‘sold' to churches throughout Europe as Catacomb Saints - the Vatican didn’t sell them, of course but collected expenses and donations for excavation, transportation, blessing and decoration. Huge sums were spent decorating them with silver and jewels before the hapless characters were displayed in altars. They were particularly popular in Austria and Germany – people named their children after them. 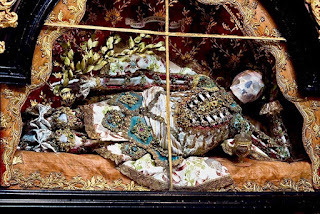 There was a problem – the skeletons were a mix of Jews, Christians and Pagans – fortunately, Vatican priests were able to determine which ones were martyrs by the glow or aroma they radiated. 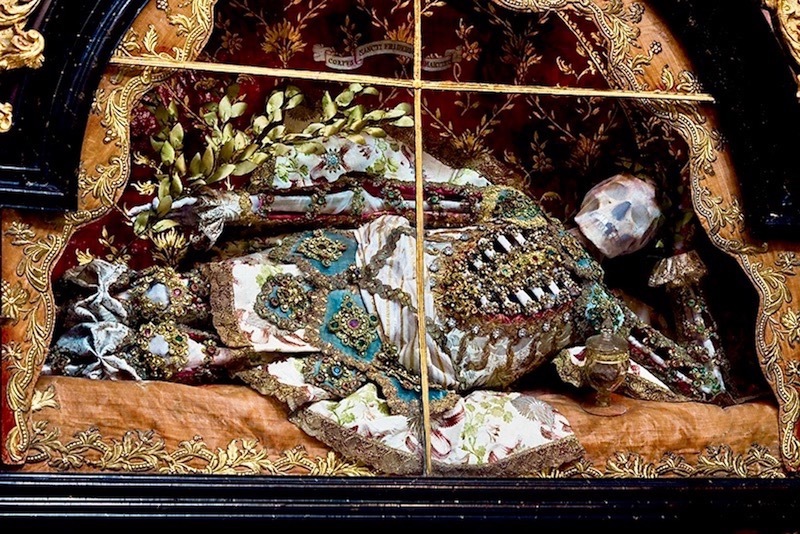 In most of Europe these rather grotesque relics have long since been reinterred but in Melk, they are still on display. The rain had stopped when we left the Abbey so we walked down the hill and through the town back to the ship. 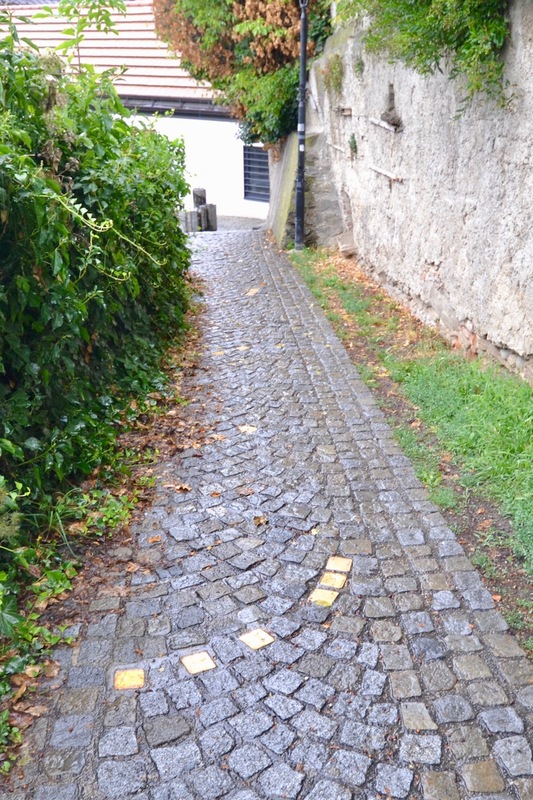 The route wouldn’t be obvious but it’s marked – you simply follow the yellow brick route – some of the cobbles are coloured. We stopped at a café for a Kafe: Austria has a well-deserved reputation for its coffee shops and this place was no exception – I would have loved to stay longer but it was time to cast-off. Love your travels and photos! 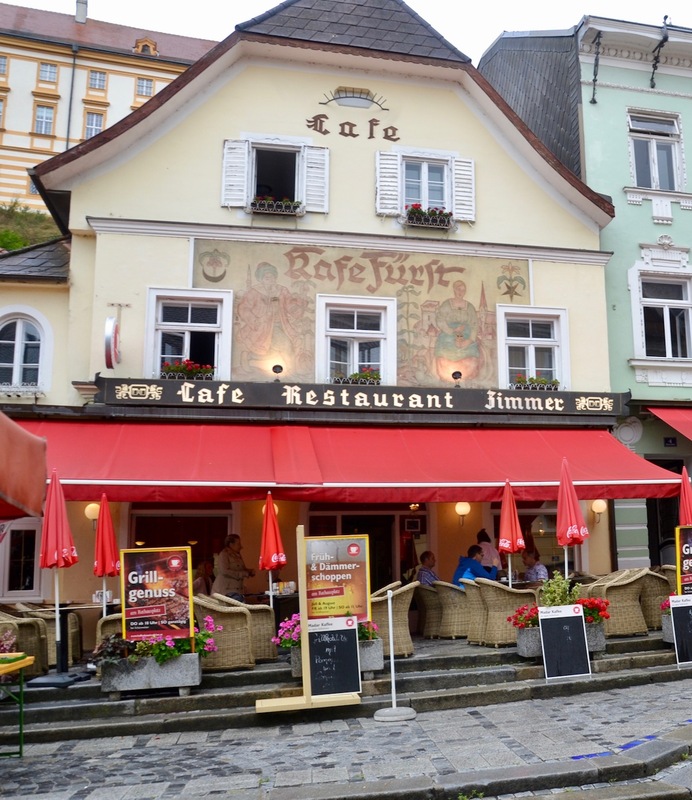 I enjoyed Melk Abbey, which we visited from a day cruise from Vienna and think we might have eaten at the same café, if it was on the main square. 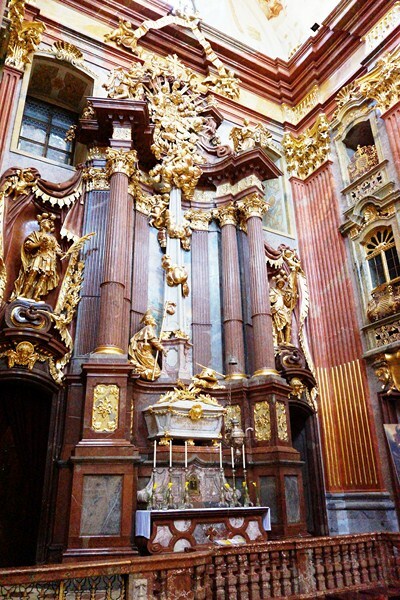 Thanks for the glimpse into Melk Abbey and it's history, Bob. Great to see that you're still travelling and having fun. Thanks Bill. Life’s still good!